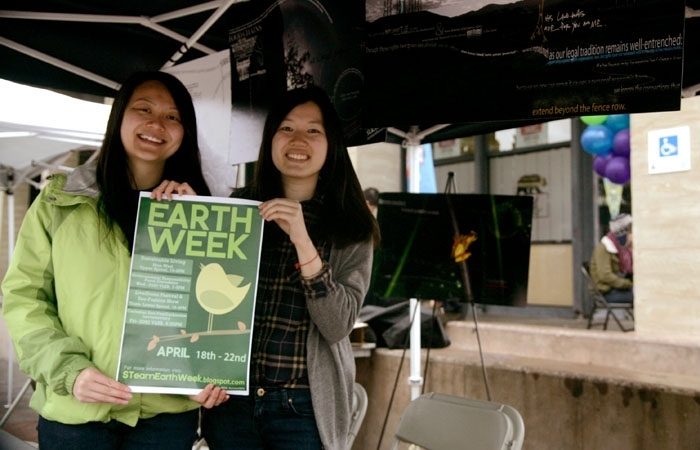 Michelle Choi and Michelle Lowe raise awareness about the environment in the week-long Earth Week celebration. Michelle Choi and Michelle Lowe have been friends since middle school. They not only share the same first name, they are also both juniors at UC Berkeley with the same major, and this year, are the two coordinators of Earth Week, the biggest sustainability festival on campus. Since the school year began, the two have spent over 80 hours a month planning the numerous activities scheduled for this week, all of which are in honor of Earth Day, which falls on Friday this year. "We want to be able to let students know that there are little things that they can do that collaboratively make a huge impact and change the world regarding sustainability," Choi said. When talking to Choi and Lowe, it becomes difficult to follow who is speaking because the two frequently finish each other's sentences, probably because of the long hours they have worked together. This year, they have struggled to balance school work and their duties for the ASUC Sustainability Team - which puts on Earth Week - to organize one of the biggest Earth Day celebrations held on a college campus. And it makes sense that this event - which historically sees hundreds of students participating - makes its home at UC Berkeley. Known for being eco-friendly, the campus topped a list of the greenest schools in the world earlier this year and just last week, the student body passed an initiative that calls to end the sale of water bottles on campus. In fact, Earth Week is financed in part by The Green Initiative Fund, which collects a $5 fee from students each semester to provide about $250,000 yearly across dozens of projects that make the campus more sustainable. Since 2009, it has provided Earth Week with $2,000 annually. The various events, which began Monday and will end Friday, range from seminars about cutting electricity usage to movie screenings, all of which center around this year's theme - to make "going green" part of everyone's daily lives. "We really want to focus on bringing a more relatable aspect - a more relevant thing for the students," Lowe said. "What little things you can do within your daily routine." Throughout the week, booths have been set up in Upper Sproul Plaza - on Tuesday, the focus was water usage, on Wednesday, energy savings - and larger events, like an eco-fashion show as well as an exposition that brings local green businesses to campus, will happen Thursday. Earth Week also serves as a symbol of the campus's ongoing commitment to sustainability, since it invites all green-focused groups to join the festivities. "Many of us in the environmental community have extracurricular activities that seem to be intertwined with sustainability groups on the Cal campus ... Earth Week is a time when all of these activities are on full display," said Tyler Grinberg, lead coordinator for a campus project to restore Strawberry Creek. "Our campus community is educated as to how we're impacting our local environment and how each of us can individually make a strong difference." Soumya Karlamangla is the lead environment reporter.